Discussion in 'other software & services' started by guest, May 23, 2012. 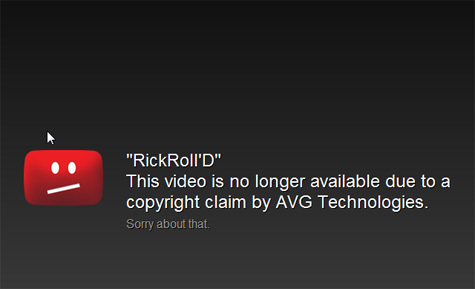 In yet another case of AVG saving the world, the company has had the original Rickroll video removed from YouTube, as reported by TorrentFreak. Why AVG would have any desire to go on an anti-Rickroll crusade remains up in the air. ~ Snipped as per TOS ~ Seriously though, this is probably about the best example of how totally screwed up the DMCA actually is. It also casts a bad light on how Google handles these things. How even their automated system got fooled by this is beyond me. It makes AVG look like an idiot as well. All around terrible and completely unnecessary situation. Never gonna give up my Rickrolls. They can have them when they pry them from my cold, dead, bartending, wall-climbing, back-flipping hands. It would take a strong, strong man. As you can see, it's back. This is what I get with that link. This error (HTTP 403 Forbidden) means that Internet Explorer was able to connect to the website, but it does not have permission to view the webpage.